Traditionally, the Vedic literature as such signifies a vast body of sacred and esoteric knowledge concerning eternal spiritual truths revealed to sages (Rishis) during intense meditation. They have been accorded the position of revealed scriptures and are revered in Hindu religious tradition. Traditionally, the Vedic literature as such signifies a vast body of sacred and esoteric knowledge concerning eternal spiritual truths revealed to sages (Rishis) during intense meditation. They have been accorded the position of revealed scriptures and are revered in Hindu religious tradition. Over the millennia the Vedas have been handed over generation to generation by oral tradition and hence the name “shruti” or “that which is heard”. According to tradition they are un-authored (apaurusheya) and eternal, and are considered the revelation of God to the Rishis. This is the other reason for calling them Shruti. Theoretically, the Vedic corpus is held in deep reverence in the Hindu society. It constitutes the most authoritative genre of Hindu scriptures. Any other Hindu scripture must agree with the Vedas in order to be considered an authority. Schools of philosophy which reject the authority of the Vedas are considered ‘Naastika’ or heretical, while schools which accept Vedic authority, even if nominally, are considered ‘Aastika’ or orthodox, from a Hindu perspective. While most Hindus never see Vedic texts in their lifetime, the term ‘Veda’ is used as a synonym for authoritativeness in religious matters. The Vedas are considered full of all kinds of knowledge, and an infallible guide for man in his quest for the four goals – Dharma, Artha (material welfare), Kāma (pleasure and happiness) and Moksha (Salvation). In sacred Hindu literature, they are considered the very manifestation of God, and the ultimate source of all wisdom and of all Dharma. Hindu priests were exhorted to study them regularly, recite their sentences, practice their sacraments and memorize their words. In practice however, this has been restricted to a dwindling minority of the Brāhmaṇa caste, despite recent attempts to revive Vedic study, ritual and recitation in the traditional manner. On the other hand, the Vedic texts are now widely available in print, and this has lead to a greater dissemination of their knowledge amongst Hindu masses, than say, a century back. Even here however, the popularization largely concerns the spiritual treatises called the Upanishads – the texts par excellence of Hindu spirituality. In fact, for several centuries now, the word ‘Veda’ has been used by Hindu teachers to indicate the Upanishadic texts in particular. How Were the Vedas Revealed? According to Hindu tradition, Bhagavān Brahmā created the Universe and then revealed the four Vedas to numerous Rishis at the beginning of this creation. Since then, an unbroken chain of students and teachers have been transmitting the Vedas down to our time. The four faces of Brahmā represent these four Vedas as well as the four directions. The Vedas are also associated with his consort Devi Sarasvati, who is the Devi of all wisdom and knowledge. The Vedas however are not the creation or composition of the Brahmā because they are eternal. Bhagavān Brahmā is merely their caretaker of this Divine knowledge, which really belongs to the Supreme Being (Brahman). However, Brahmā also composed some original works, which initiated many other branches of Hindu knowledge – like Ayurveda, Dharmashāstras etc. All these works whose tradition started from the original compositions of Brahmā are called Smritis; whereas the Vedas which were revealed by Brahmā but not authored by him are called Shruti (‘that which are heard from Brahman’). As time progressed, the capacity of human beings to study scriptures declined. Sometimes, the Vedas even got lost. Therefore, a Rishi appeared periodically to re-arrange them and even rediscover them. The current version of the four Vedas is said to have been given their present form by Rishi Veda Vyasa, who was the son of Rishi Parāshara, and a fisherwoman named Satyavatī. 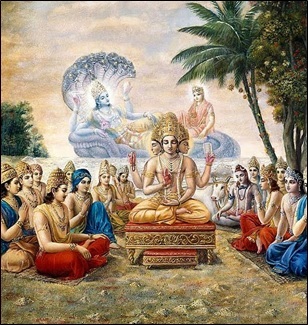 Veda Vyāsa then taught the Rigveda, Yajurveda, Samaveda and Atharvaveda to his four students: Rishi Paila, Rishi Vaishampāyana, Rishi Jaimini and Rishi Sumantu respectively. They in turn taught them to numerous disciples and so on, leading to slightly differing versions of the four Vedas. These versions are known by the names of the last Rishis after whom no other modifications were made to the texts of the Vedas. However, another viewpoint is that hundreds of very ancient Rishis (mainly on the banks of the river Sarasvati which dried out by 1500 BCE or even earlier) received the hymns and sections of the four Vedas from Brahman. Brahmā has no role to play in this viewpoint. A big chunk of these revelations were lost with time, and Veda Vyāsa compiled whatever remained, to preserve it for posterity. Even the existing Vedic literature is 6 times the length of the Bible, and is much older! There is a third, modern viewpoint proposed by Swami Dayanand Saraswati (1824-1873 CE). According to this view, the Supreme Being revealed the four Vedas respectively to Rishis Agni (Rigveda), Vāyu (Yajurveda), Āditya (Samaveda) and Angirasa (Atharvaveda). The Vedas are four in number – Rigveda, Yajurveda, Sāmaveda and Atharvaveda. According to tradition, each Veda can be divided into two parts – Mantras and Brāhmaṇas. A collection of Mantras is typically called a Samhitā, although they can also occur in the Brāhmaṇa texts. Currently, and often in ancient Hindu tradition as well, it is often the Samhita portion alone which is referred to as the Veda. For instance, the word ‘Rigveda’ would typically mean the Rigveda Samhitā. The Ārya Samāj school of Hindus, responsible for the modern revival of Vedic study in northern India, and founded by Swami Dayanand Saraswati in 1875 CE, in fact rejects the Brāhmaṇas as portions of Vedas. For them, the Vedas include only the four Samhitās – Rigveda Samhitā( Shākala version), Atharvaveda Samhitā (in its Shaunaka version), Yajurveda Samhitā (Mādhyandina version) and the Sāmaveda (Kauthuma version). All other Samhitās and the rest of the Vedic literature is considered by them to be outside the Veda proper. The Brāhmaṇas have their own names and are more like theological treatises of the Vedas. The ending portions of many Brahmanas have an esoteric content, called the ‘Āraṇyaka’. Embedded in these Āraṇyakas, or normally at their very end, are deeply spiritual treatises called the ‘Upanishads’. For several centuries now, Upanishads are the mainstay of Hindu spiritual traditions, and are held in the highest esteem. In the case of the Rigveda, Samaveda and the Atharvaveda, there is a clear-cut separation of the Mantra collection from the Brahmana portions. In contrast, the Yajurveda is of two types: Shukla (or ‘white’) Yajurveda and Krishna (or black) Yajurveda. In the former, the Mantra and Brāhmaṇa collections occur separately from each other. But in the latter, the Mantra and the Brāhmaṇa portions are intermixed. Thus, the Taittiriya ‘Samhitā’ belonging to the Krishna Yajurveda has Mantras interspersed with Brahmana portions. Even the Taittiriya ‘Brahmana’ has both Mantras and Brāhmaṇa passages mixed with each other. Coming to the Brāhmaṇa texts, there is often no clear-cut distinction between the Brāhmaṇas proper and the Āraṇyakas, or between the Āraṇyakas and the Upanishads. The Brāhmaṇa text proper often merges into the Āraṇyakas and many old Upanishads are actually embedded in the Āraṇyakas. There are a few exceptions even to the above generalizations on the internal distinctions in the Vedic texts. What are Mantras? What are Samhitās? The Hotr priest who sings hymns to Gods inviting them to preside over the sacrifice. The Brahmā priest well versed in all the Vedas who supervises the sacrifice. The four Samhitas are said to have been compiled to fulfill the needs of these four main priests: Rk-Samhita for the Hotr, Sama-Samhita for the Udgātā, Yajurveda Samhita for the Adhvaryu and the Atharvaveda Samhita for the Brahma priest. Initially however, there was no special connection of the Brahmā priest with the Atharvaveda, as this Veda was and is not as closely integrated with Vedic ritual as the other three Vedas are. Mantras are basically of 3 major types, when classified according to their physical form: Riks, Yajus and Sāmans. Riks are versified mantras. Yajus are prose mantras whereas Sāmans are melodies set on Rk. The Rigveda is so called because it is comprised of Riks. The Yajurveda is so called because it is composed predominantly of prose mantras (Yajus) although it has hundreds of Riks as well. However, even the Riks in Yajurveda are recited as if they were prose passages. The Sāmaveda Samhitā is composed of melodies called Sāmans, and also the underlying Riks which are set to these melodies. The Atharvaveda is comprised of Riks (5/6 portion) as well as Yajus (1/6). Some adept Vedic scholars can set even the mantras of Atharvaveda to melodies. Theoretically, the Mantras have a higher authority than the Brahmanas. The word ‘Brāhmaṇas’ means ‘through which we can know Brahma’, where ‘Brahma’ is another name for the Vedas. Therefore, the Brāhmaṇas are texts which expound the Vedic mantras and Vedic ritual ceremonies (Yajñas). These scriptures are characterized by statements of eulogy, censure, exposition and (ritual) application (of mantras). Many scholars, modern and ancient, have tried to define the Brāhmaṇas by stating their characteristics. The reality however is that there is no sharp difference in the characteristics of the Mantra and the Brahmana portions of the Vedas. The only thing that we may state safely is this – Mantras are those portions of the Vedas that are designated as such traditionally. And the rest is Brāhmaṇa. Unlike the mantras, which are mostly in verse, the Brāhmaṇas are predominantly prose. The Brāhmaṇas contain formulas for rituals, rules and regulations for rites and sacrifices and also outline other religious duties. The formulas and rules for conducting extremely complex rituals are explained to the minutest detail. And every ritual is performed for a specific purpose for which a specific effect/benefit is expected. It was felt that there was nothing that could not be achieved by sacrifices – the sun could be stopped from rising and Indra, the chief of Deities, could be deposed from his throne. The duties of men professing different occupations, the eternity of the Veda, popular customs, cosmogony, historical details, and praise of ancient heroes are some other subjects dealt with in the Brāhmaṇas. The Brāhmaṇas which deal predominantly with Vedic Yajnas fade gradually into more spiritual treatises called the Āraṇyakas. These scriptures contain several techniques of meditation and they explain the esoteric and mystical meanings of Yajñas. In short, the symbolic and spiritual aspects of the Vedic religion are meditated upon in the Ārañyakas. The word Āraṇyaka means “belonging to the wilderness” that is, as Taittiriya Āraṇyakas says, “from where one cannot see the roofs of the settlement”. According to some scholars, the other reason for their name is that this portion of the Vedas was the primary focus of study during the ‘Vānaprastha’ (forest hermit) state of one’s life, when the person retired from active life in his old age to lead a sedentary lifestyle devoted to study of scriptures and performance of specific Vedic Yajñas. They are restricted to a particular class of rituals that nevertheless were frequently included in the Vedic curriculum that was primarily conveyed individually from teacher to student. 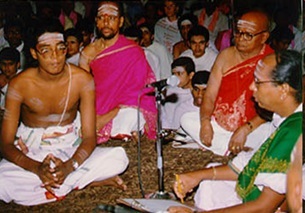 They convey the non-apparent spiritual meanings of the Vedic ceremonies. The Āraṇyakas are associated with and named after individual Vedic shākhās or branches. Katha Āraṇyaka belongs to the (Charaka) Katha Shākhā of the Krishna-Yajurveda. Only fragments of it survive and are being still published. Brihad- Āraṇyaka in the Mādhyandina and the Kāṇva versions. The Mādhyandina version has 8 sections, of which the last 6 are the Brihadarāṇyaka Upanishad. Talavakāra Āraṇyaka or Jaiminiya Upanisadbrāhmaṇa belongs to the Talavakāra or Jaiminiya Shākhā of Sāmaveda. The first three of the eight chapters of the Chhāndogya Upanishad have the nature of a Āraṇyaka. Āraṇyaka Samhitā The Pūrvārchika of the Sāmaveda Samhitās have a section called the ‘Āraṇyaka Samhita’ on which the Āranyagāna Sāmans are sung. The Atharvaveda has no surviving Āraṇyaka, though one may regard the Gopatha Brāhmaṇa as its Āraṇyaka, a remnant of a larger Atharva (Paippalāda) Brāhmaṇa. The Vedas have highly philosophical portions called the Upanishads, that form the bedrock of Hindu spirituality and theology. The Upanishads typically occur towards the end of the corpus of their respective Vedic Shakha and therefore they are often also called ‘Vedānta’. For example, the Taittiriya Shākhā of Yajurveda is arranged in the following manner: Taittiriya Samhita, Taittiriya Brāhmaṇa and Taittiriya Āraṇyaka. The last 4 of the 10 chapters of the Taittiriya Āraṇyaka comprise the Taittiriya and the Mahānārāyaṇa Upanishads. The presence of the Upanishads towards the end of their respective Vedic corpus indicates that they represent the final conclusion (Siddhānta) of the Veda. This is another reason why they are called Vedanta (Veda + Siddhānta). Muṇdaka, Māṇdukya and Prashna Upanishads belonging to the Atharvaveda. Tradition lists 108 Upanishads as the major Upanishads, and close to 200 Upanishads survive. However, the above 15 Upanishads and some others (such as Nīlarudra, Chhāgaleya, Ārsheya, Shaunaka, Bāshkalamantra) alone are the ancient Upanishads. Several portions of the Samhitā proper (e.g., the Brahmasūkta of the Atharvaveda), Brāhmaṇa proper (e.g., the first few sections of the Jaiminiya Brāhmaṇa or the Agnirahasya portion of the Shatapatha Brāhmaṇa) and Āraṇyakas (e.g., Chapters 9-10, 14-15 of the Shānkhāyana Āraṇyaka) are also similar to Upanishads. Many of the newer Upanishads propound doctrines related to Sannyāsa, Yoga, Sāmkhya, Vaishnavism, Shaivism, and Shāktism, worship of Gaṇapati and also summaries and expositions of the newer school of Vedānta such as Advaita Vedānta. Such sectarian Upanishads have been utilized to the hilt by later Hindu teachers to provide the Shruti based ‘proof’ that their sectarian ways are exalted above the other sectarian ways. While doing so, they quote the Upanishads selectively but never reject the other Upanishadic texts directly or indirectly since the Shruti cannot be rejected at all. For example, the Vaishnava Vedantists quote the Nārāyaṇa Upanishad and similar Upanishads profusely to prove that Lord Vishnu is the Supreme Lord and all other Deities are lesser, explaining away the Shaivite Atharvashīrsha Upanishad. The Shaivite Vedantists do the opposite. The Vedic texts were traditionally transmitted orally (or at least predominantly without the aid of manuscripts, which might have been used sparingly as memory aids). This was essential because the texts were ‘accented’, or in other words the different words or letters therein were recited according to different pitch/tones. Very elaborate mnemonic devices were developed to preserve the texts with great fidelity, and harsh Divine vengeance and evil repercussions were promised to those who deformed or mutilated the text in any manner. As a result, several Vedic texts were indeed transmitted over several millennia with utmost fidelity, together with accent. It took several years for a student to memorize one or more Vedic texts, word for word, letter for letter, with the correct accent, under the personal supervision of a competent teacher. The texts that are used for aiding the memorization and recitation of the Vedas with utmost fidelity, are called ‘Lakshaṇa Granthas’. These texts include Anukramaṇīs, Padapāthas, Ghanapāthas, Kramapātha and other Vikrtis or modifications of the root text, phonetic treatises like Shikshās and Prātishākhyas and so on. In some cases however, the accents were lost with time and the texts had to be recited without the Vedic accents. This is called the ‘ekashruti’ mode of recitation. A prime example of such a text is the Paippalāda Samhitā of the Atharvaveda. Similarly, Bhatta Kumārila (circa 650 CE) notes that the Brāhmaṇas of Samaveda had lost their accents even in his times and were recited without them.